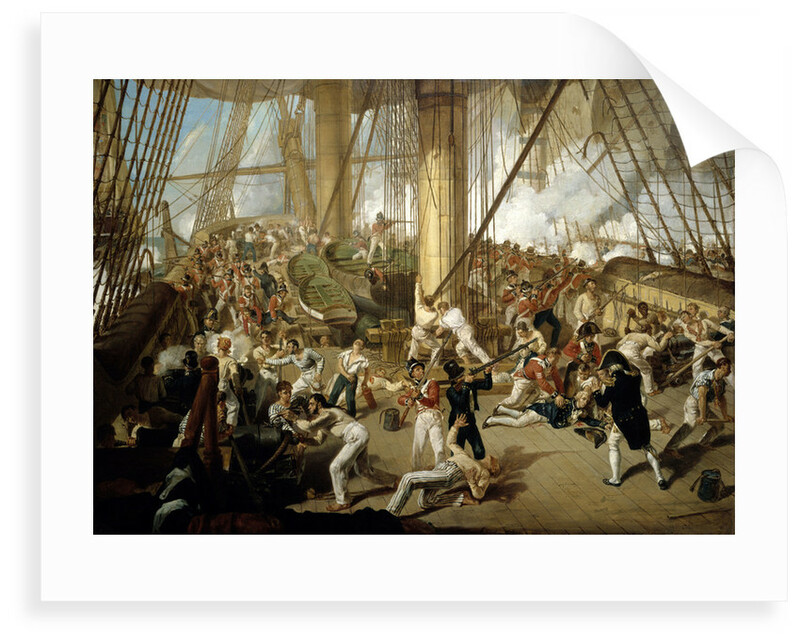 An impression of the mortal wounding of Horatio Nelson on the upper deck of the 'Victory', painted many years after the event. 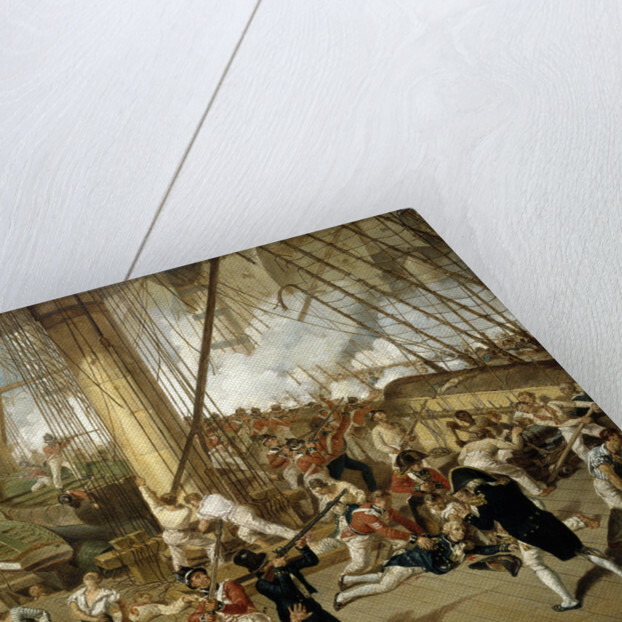 On the right, Nelson is portrayed at the moment he falls on his left side. Captain Hardy, with his back to the viewer, advances to assist Royal Marine Sergeant Secker, who is already at Nelson's side. In the centre foreground, Midshipman Pollard aims with a musket, to return the fire of the French marksman who shot Nelson, and a marine to his left also prepares to fire. In the midst of the action, the artist has shown that very few of the crew are aware that Nelson has been hit. In the immediate foreground, a sailor who has been shot falls backwards on to the deck. In the left foreground, a gun is being sponged and primed by its crew, while beyond it another is being fired. A group of marines' fire over the port gunwale towards the Franco-Spanish 'Santissima Trinidad', 140 guns, while a corporal and marine carry off one of the officers, possibly Captain Adair of the marines, who was killed. In the left background, gun-crews operate the port fo'c'sle guns. 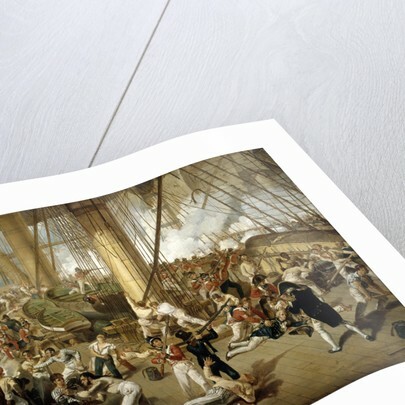 In the left centre of the picture, beyond the gunner in the foreground, a powder monkey has been hit and clutches his left hip, in a gesture imitating that of Nelson. Behind him lies a dead sailor. Two sailors work on the halliards at the bottom of the mainmast. In the barge are three marines, one dead, one firing into the 'Redoutable', 74 guns, and one priming his musket. Beyond them are figures and smoke on the fo'c's'le. 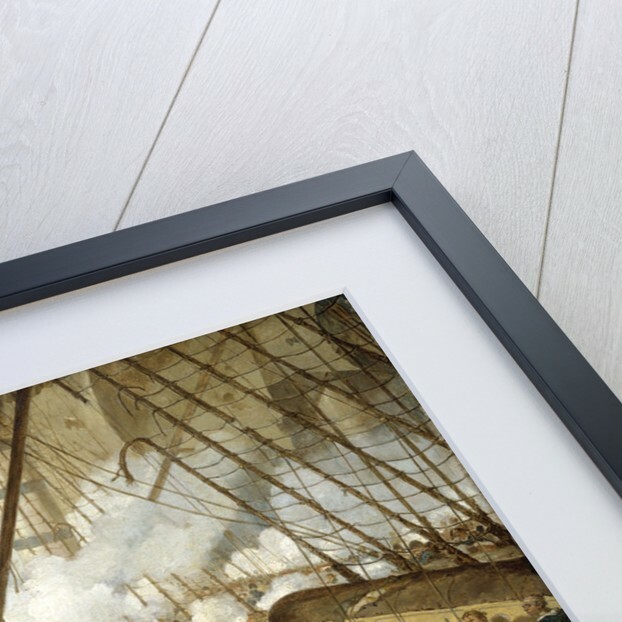 To the right of the mainmast, marines fire over the gunwale in the starboard waist towards the 'Redoutable' whose crew are visible through the smoke. More by the artist Denis Dighton.